Golden Orb Spider relative found; largest spider fossil ever. 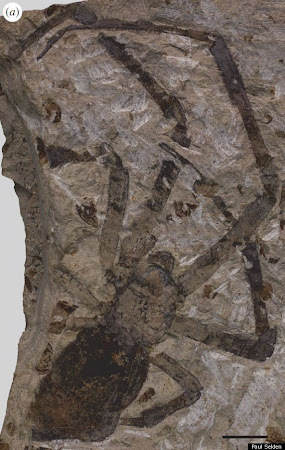 Huffpost reports on the largest spider fossil ever found, a distant relative of the modern Golden Orb Weaver spider, a common sight in Taiwan on slopes in the lower elevation. Wikipedia has all you ever need to know. A temple god watches over the onion fields of Kenting. Su had faced charges of accepting NT$5 million (US$174,845) in bribes to speed up approval of a landfill in the county by skipping an environmental assessment. Prosecutors had argued for a 15-year sentence and an eight-year suspension of civil rights. The ruling was keenly watched after Su and other DPP politicians said that prosecutors were on a “political witch hunt” to find misconduct connected to the Yunlin County commissioner. The arrest of Su, who had a reputation for integrity, was especially outrageous and one was of a series of events that prompted the first Open Letter from Scholars on the situation in Taiwan. Jon Adams had a good article on the arrests at the time. But let's recall -- how was public opinion in this case even constructed? Oh yeah -- the infamous skit that showed Chen Shui-bian as an AIDS victim. Remember that? The Ministry said it was OK because it reflected the sentiment on the island. And then there were the leaks about the case from the prosecutors, which caused the local judicial reform foundation to slam the prosecutors back in Dec of 2008. And remember when 8 prosecutors called a press conference to announce that they would pursue the Chen case to get a conviction right to the bitter end, which I said at the time was basically an admission that they had no evidence? Then there was the flow of new charges... This constant churning of the media by the prosecutors, as well as the baying for Chen's blood in the pro-KMT press, has of course had a profound effect on public opinion. "Trial by media," the South China Morning Post, no friend of the DPP, called it. But the prosecutors citing public opinion in their appeal, the public opinion that they themselves helped nurture through their own questionable actions, is surely a new low. The second act of this trial-by-media approach is to use the attacks on DPPers to whip up votes for the KMT. Chen was indicted Sept. 22, 2009 for withholding US$30,000 from a sum of US$100,000 given to him by the Ministry of Foreign Affairs for discretionary spending during each of his 11 overseas trips as president between August 2000 and September 2006. The prosecutors charged in the indictment that Chen wired the funds -- a total of US$330,000 -- to his son Chen Chih-chung, who was studying in the United States at the time. But the judges dismissed the indictment as "a shoddy mishmash of evidence without a morsel of credibility." They said the prosecutors contradicted themselves by claiming in their indictment that the spending of the allowances was "totally under the control of the Foreign Ministry and the president had no say in the matter, " but in the same breath, the indictment said that "the allowances were meant to finance the president's unexpected spending on state affairs." The judges also criticized the prosecutors for using the testimony of Wu Wang-hsia, mother of ex-first lady Wu Shu-jen, against her daughter, despite being fully aware that Wu Wang-hsia was not of sound mind and actually misidentified her son as her husband occasionally in her deposition. This means that, in addition to a couple of cases still pending, Chen is in jail for two things -- accepting a bribe from Diana Chen case (see this post) and the Koo family land case bribe. 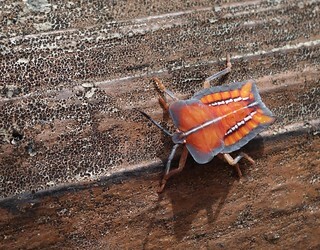 The Koos were in court last week in connection with a different case when this came out. Don't read Chinese? It says that a $300 million NT bribe that was allegedly given to the Chen Shui-bian family never went to them. Read the first page of this Commonwealth article to get a feel for the claim(s). Testimony in the Chen case was also collected from Jeffrey Koo, another Koo family scion, who was on the run from authorities, came back to Taiwan to "testify" in connection with the alleged bribe and was interrogated for two hours but notes only covered a half-hour, and then sent out of the country again. No deal was made, claimed prosecutors. Chen case coverage here. Tsai Ing-wen posted the following comment on her Facebook page regarding the verdict in Su's case. My translation in English follows. [This afternoon Yunlin County Commissioner Su Chih-fen was found not guilty in the first hearing. During the period of waiting for the verdict I believe that the people of Yunlin County have always kept their trust in the ability and personal integrity of Su just like I have. The justice system has returned Su's state of innocence. It has also given the people of Yunlin County a sense of justice. Everybody can have a sense of feeling gratified. I was disappointed by Tsai's weak response to my question about the death penalty at the meeting last Saturday. However, her comments about judicial reform in response to another question were much more impressive. I think these comments show that Tsai realises judicial reform is a task of the utmost importance if she is elected to the presidency. However, despite her legal background this is a task that Tsai cannot complete on her own. She needs strong support from the legal community and all those who support human rights and justice in Taiwan. In related news, the Taipei Times had another editorial on the revolting saga of the Hsichih trio. China’s Taiwan Affairs Office (TAO) warned the Democratic Progressive Party (DPP) yesterday that it risked serious problems if it pressed for independence. “If [their] cross-strait policy is established on a ‘Taiwan independence’ splittist basis ... it does not matter how ingenious the packaging, it will certainly ... damage the peaceful development of cross-strait relations and affect stability in the Taiwan Strait,” TAO spokesman Yang Yi (楊毅) said. A sound endorsement, that. But note how the PRC stays on message -- it is democratic choice that causes the problem, not the PRC's desire to extend its empire.This reverse-of-reality messaging has made headway in certain quarters in the west, sadly. In telephone surveys carried out by the United Daily News (UDN) and the China Times, Tsai was marginally ahead of Ma, while Ma narrowly outpaced Tsai in a similar poll done by the TVBS cable channel. The article has some good information on how voters might compare the two. If only she were rational like Beijing, and threatened to maim and murder to get her way. Bloomberg's reporting does not present any of Dr. Tsai's qualifications, accomplishments, or policy stances, save that she once angered Beijing. No slant there! Readers must wonder who she is and why she was selected. I thank Bloomberg for this; reporting like this is responsible for the continued existence of us bloggers. The Kuomintang Generalissimo Chiang Kai-shek retreated to Taiwan with tens of thousands of followers in 1949 after losing the civil war to Mao Zedong. Though political rivals, the KMT and Communist Party are united in their one-China policy, while native Taiwanese like Tsai and Lee have increasingly sought to carve out an independent state. That's actually a fairly good representation of the current state of affairs and kudos to Bloomberg for printing it. Much better than AP's asinine, erroneous, and pro-Beijing "split in 1949". But she also acknowledges that a robust commercial relationship with China — combined with strong ties with other countries — is necessary for Taiwan's long-term prosperity. That is a significant departure from the policies of the DPP's Chen Shui-bian, who infuriated China during his 2000-2008 presidency by pushing for greater independence. Tsai, who has a doctorate from the London School of Economics, began her political career in the late 1990s under former Nationalist President Lee Teng-hui as an adviser on Taiwan's National Security Council. She reportedly made several secret trips to Washington to help ease American worries about Chen's independence-leaning stance while serving as head of the Cabinet-level body responsible for China ties between 2000 and 2004. The Economist has a similar piece here. The China propaganda rag WantChinaTimes has a report here. It contains little you haven't already seen. Meanwhile, all the speculation you want on the Veep choices of the two candidates. Neil Wade. Holy Ridge. Gorgeous. Expat Myths: are they in Asia for the beer or the women? 20 years of cycling on The Beautiful Island. A china centric piece in the Yale Journal of Something or Other on the Anti-secession law and what it indicates about that moderate Hu Jintao and Taiwan-China relations. Wow. Pinch me. Kuoguang's board has formally withdrawn the proposal for its petrochemical complex in Changhua. Taiwan's main opposition party says chairwoman Tsai Ing-wen has secured its presidential nomination after winning an island-wide telephone poll. The Democratic Progressive Party is expected to announce Tsai's nomination formally on May 4. The poll results were disclosed at a party press conference in Taipei on Wednesday. A cool-headed intellectual, Tsai has departed from the DPP's anti-China tradition and promoted exchanges with the mainland. The two sides split amid civil war in 1949. Hahahaha. The media will never get the DPP's relations with China correct. AP even slipped in the historically erroneous "split in 1949" formula, which has nothing to do with anything else in that paragraph or indeed with the announcement at all. Tsai will make a strong candidate and mount a powerful challenge. Very happy to see this. And noses, for counting, arrayed in rows. Holding the election on Jan 14 disenfranchises thousands of young voters who would have been able to vote had the Presidential election been held in March as is usual (here, for example). These voters tend to favor the DPP. That weekend is the weekend for college entrance exams, now moved to the Monday. Troublesome for many parents who want to accompany their children to the exams. That weekend is the weekend before Chinese New Year. For many Taipei residents who have their households down south, they will have to go south twice in two weeks, on crowded roads and transportation. This will deter many from returning south to vote. Since it is the weekend before Chinese New Year, many businessmen in China will return home a week early to vote. That makes convenient for them. Although many claim this bloc is somewhat pro-KMT I am not convinced of that. Combining elections allows the DPP to focus its money more economically, offsetting the KMT's massive financial advantages. Holding elections in Jan means that a large number of people who might have died before the March elections will be able to vote. In 2010 ~140,000 people died (here). Arguably this means an extra 35,000 people will be around to vote, more or less. This helps wash the 50,000 kids it is alleged will not be able to vote. Combining elections makes it more difficult for small parties to get seats (here). Combining elections means turnout will be higher. My perception is that higher turnout favors the DPP. In fact I have heard that the perception among both the DPP and KMT analysts is that the South is going to be a pro-DPP bloodbath. The KMT appears to be gambling that higher turnout will favor it. In a combined election vote buying to get people out to vote will for the first time affect the Presidential election, which is generally considered free of it. And we all know which party does the most vote buying. The fact that the government rushed through the combined elections before the laws had been properly amended implies a political motive for combining them (here). The most important thing to take away from all this? The key factor isn't combined elections. It is how the two parties run their campaigns. It is how the party machines function. It is who becomes the candidates. If the DPP has a strong candidate (hint: TSAI TSAI TSAI) and runs a good campaign then it doesn't matter when the elections are held, the DPP can take the Presidency and bring in many of its own people into the legislature on her coattails. And if the DPP loses, it won't be because the elections are combined. Another issue I'd like to bring up. A couple of months ago the brilliant election observer Nathan at Frozen Garlic argued that if the legislative election follows the recent shifts in voting in the by-elections, city council and mayoral elections, the DPP could take as many as 34 seats and the KMT fall to 39 in the LY elections. I didn't buy that argument, probably due in part to my natural pessimism, but also because the blocs of voters for the LY, mayoral, and Presidential elections are not the same and behave differently. But the CEC has nullified my objection by effectively uniting all the disparate blocs of voters. Even if you argue that it hurts the DPP in the Presidential election, it might help it with the legislature. Looking forward to Nathan's next analysis! Beware heretics! The Inquisition has wheels! I'm finally done with my sojourn in Pingtung, so the links are back. Enjoy! Tung Chen-yuan, a professor at Taipei's National Chengchi University's Graduate Institute of Development Studies, cast his eye on the numbers after the so-called early-harvest list of goods subject to tariff concessions 539 Taiwanese products and 267 mainland products – went into effect Jan. 1 under the ECFA. After the list, an object of considerable political wrangling between the ruling Kuomingtang (KMT) and its opponents, came online, the Ministry of Economic Affairs (MOEA) began placing advertising in local newspapers, boasting that “according to statistics,” the value of Chinese imports from Taiwan in January and February increased by 20.19 percent. It was further pointed out that the rise included a 28.47 percent increase in the value of products exported on the early harvest list. For President Ma Ying-jeou's administration, it seemed like a pretty obvious win and that those railing against the trade deal with China were wrong. But Tung, the author previously of a sobering look at Taiwanese business people being victimized on the mainland, Doing Business in China Isn't All Roses, Asia Sentinel, Feb. 21, says the government is promoting a fairytale. Here’s the catch: instead of the rather sobering economic data gathered by the Taiwanese authorities themselves, the KMT government has been presenting China's trade numbers as its own to make its case for the ECFA to its people. Read the whole thing. It's a devastating indictment in every way, if true. Government says Dachen wetlands might become preserve. the Lin family gardens in Banqiao from Steve Crook. David on Morning Tea with Tsai Ing-wen. Ben as well. Oz on the gayness factor in Taiwan's politics. Writing Baron dresses down a rude guy on a train. Dom is back with a great piece on tarts. Michael on our ride in Kenting. Dating in the Hsinchu Science Park: overcoming the 14-1 ratio. Taiwan's cinema "innovative unique and powerful"
Apple Daily Poll has Tsai and Su thumping Ma. Hahaha. No way. Analysts mull Kuokuang impact. Yes, President Ma has indicated the site of the proposed petrochemical complex will be made into a Wetlands Conservation Park. It is hard to believe, bt this project might really really be dead. Pinch me. Small parties don't want the Presidential and Legislative Elections merged. Sinocentric with article on the new socialism in China. 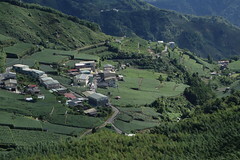 Pingtung County government takes people up Mt Dawu on annual rite of passage. WSJ column: China hopes boost Taiwan banks. On my way home from Pingtung last week I took a few minutes to stop by the bunker on the railroad line there not far from Fangshan. The bunker is nearly 2 kms long and appears to be constructed to protect trains in case of air attack. If you walk alongside it has airholes punched in the sides for ventilation. The south opening. We searched around for a plaque or other explanation of what it is or when it was built, but couldn't find one. Cool, though. UPDATE: Map is here, I've marked the southern entrance. Ma had the confidence of 43.5 percent of the people polled, according to an April 20 statement on the website of Taipei- based Global Views Survey Research Center. As many as 32.9 percent of the respondents in the survey said his performance was satisfactory, according to the statement. Good news for the DPP as Ma's poll numbers, which peaked briefly in Jan, are appearing to return to their more natural level of 32.9%, as the latest Global Views poll indicates. Dissatisfaction with Ma is now at 56%. This is the third straight month of slumping numbers for the President, so perhaps we've established a trend. Similarly, the numbers from the TVBS poll from the first week in April were 30% satisfied and 50% dissatisfied. The mess with the appointment of the judge appears to have hurt Ma, whose ridiculous explanations were not believed. In that same poll TVBS also asked about the Kuokuang Petrochemical complex, confirming my anecdotal experience: just 22% supported it, while 48% oppose it. GVSRC poll indicated President Ma’s approval rating was 35 percent and disapproval rating 52 percent. Compared with last month, Ma's approval rating slipped 3 percentage points and his disapproval rating edged up by 0.7 percentage points. 42.4 percent of the polled had trust in President Ma but 43.2 percent said otherwise. Compared with the previous month, the level of public trust in Ma dropped 3 percentage points while the level of public distrust in Ma advanced 3.1 percentage points. Generally speaking, President Ma receives more negative evaluation and less positive evaluation on his approval rating and public trust rating this month. Public evaluation on President Ma returns to the level he received during the five mayoral elections in November last year. The GVSRC didn't want to complete the thought, but the KMT won 3 of 5 of the mayoral elections only because one local gangbanger decided to assassinate another and instead shot the son of a powerful local politician. In other words the GVSRC is setting out a warning that Ma's numbers signal vulnerability. If Bloomberg keeps churning out dreck like this, I'll have plenty to blog on this coming election season. Keep up the bad work! Taiwan's energy security dilemma: question -- what percentage of our coal comes from China? James Wang rip of the KMT administration on the Open Letter to Ma. Wang is a former Deep Blue turned Green. Suddenly Washington big thinkers discover that the policy of feeding the Chinese beast isn't making it more tractable. Who coulda thunk it? Hahahahahaha. No really, scammed of $400K for....french toast? Centered on Taipei -- a mag aimed at foreigners, published by the Community Center. US re-deploys drones to help Taiwan, not only doing something good with them, but removing them from the Middle East where all they do is kill civilians and cultivate more militants, as well as symbolize our expensive, suicidal obsession with the region. Jamestown Brief with an excellent, in-depth, numbers-driven analysis of Ma's defense policies. RealClimate with an excellent piece on how early agriculture impacted the earth. So there I was, sitting around, thinking about what to blog on, when someone flipped me a link to another glurge on the joys of selling out Taiwan to China, this one by Ted Galen Carpenter. It's so great because (1) I have something to blog on and (2) a piece by Carpenter is guaranteed to be awful enough that no thought will be required to completely debunk him. You all remember Carpenter, right? He used to turn out misinformed pieces on Taiwan's "failure" to take care of its own defense. Since time has revealed that much of the problem of Taiwan's "failure" to purchase weapons lay in Washington's refusal to sell it what it needs, Carpenter has gone strangely silent on that issue. These commentaries arguing that the US should sell out Taiwan, cropping up lately like brightly-colored fungus on the rotting log of failure and shortsightedness, all present the same slanted and highly decontextualized picture of Taiwan. Carpenter's is a by-the-numbers example of this genre. It is entirely predictable in the fraudulent logic of its discourse: democratic leaders are "provocative", the problem is Taiwan -- not China, no China, never China -- and Japan, India, and other cases of current Chinese expansionism, which might shed light on the issue, are ignored. Like Bruce Gilley's inane piece on Finlandizing Taiwan that appeared to spawn this latest wave of Taiwan Sell Out Zombies, it succeeds only because it refers the reader to a world that doesn't exist. As I am fond of pointing out, the "Taiwan issue" isn't a Taiwan issue at all; it's a China issue. The issue with Taiwan, as it is with India's Arunachal Pradesh, Tibet, Xinjiang, the South China Sea, the Senkakus and several other places, is Chinese territorial expansionism, all of it postwar. If annexing Taiwan to China would solve that problem, then it might be a permissable solution. But of course, selling out Taiwan to China doesn't address the issue of Chinese territorial expansion. Thus, selling out Taiwan to China will not even address, let alone solve, the problem. Instead, it will merely move the problem forward to the next rung on the ladder, the territorial claims on Japanese (and other) territory. Right now the Okinawan problem is dormant: how long, with Taiwan annexed, before Beijing breathes new life into it? Which brings us to a second major missing component of Carpenter's presentation: Japan. Anyone who wants to argue that Taiwan should be sold out must remove Japan from their discussion (note that it is not present in Carpenter's) precisely because Taiwan is bound up with territorial claims and Japanese security issues. First, even if we won't intervene in an invasion, offensive operations against Taiwan are very likely to take place in Japanese air and sea space, meaning that Japan will be dragged in. Recall that Japan has a defense treaty with the US. Further, the longer resistance goes on, the more likely it is that violations of other US allied nation air and sea space will take place (how far is the Philippines?). The fact that the US does not immediately intervene does not mean that at some point it won't have to. Of course, even if China annexes Taiwan without bringing in Japan, it is obvious that the next step is the Senkakus, which are covered under the US-Japan security treaty. The two nations have even conducted military exercises in the islands for just that purpose. Beyond that is Okinawa, and the gods alone know what other claims China might invent once Chinese officials stand in Hualien and look out to sea. In other words, the proper context -- entirely missing in Carpenter's short piece -- is the entanglement of Taiwan and Japan with overlapping Chinese territorial claims. Once that context is restored, it is easy to see that selling out Taiwan won't solve the problem of US involvement in East Asian security issues. Indeed, it will merely increase our headaches, leading to intensified pressure on Japan and to even greater claims on the South China Sea, with the bonus of ceding to Beijing control of the airfield and other facilities on Dongsha Island in the Spratlys. I'm sure Malaysia and the Philippines will be delighted by that. Carpenter follows that standard Beltway line that Ma has "reduced tensions" with Beijing. Naturally, Ma's party is allied to Beijing and he himself is ardently pro-China. But as I have noted before, because his party is quietly selling out the island to China, Beijing is now free to ramp up tensions elsewhere along its border. Less "tension" over Taiwan -- and remember that increasing "tension" is a policy choice of Beijing designed to gain it leverage over the minds of observers like Carpenter -- means that tensions have merely been redistributed to other areas of the Chinese borders, not lessened. In other words: Ma's policies are actually enabling Chinese territorial expansion. This points to a hidden psychological strategic value of Taiwan: it rivets Chinese strategic attention (consider the vast expenditure of resources required merely to maintain the threat level against an island Beijing does not need and did not begin to consider part of China until WWII was underway). An adroit foreign policy would make use of that. A maladroit one would, well, hand that advantage back to China. D'oh. Another issue in any piece on selling out is the possible consequences for the peace. Would Beijing refrain from further territorial expansion if it annexed Taiwan? Consider Tibet. In the 1950s China annexed Tibet. Using Sellout Logic, this should have resulted in a quiet Himalayan frontier with no further territorial expansion by China. But of course the exact opposite has happened: the world has acquiesced in the annexation of Tibet, yet China has moved on to claim the entire Indian State of Arunachal Pradesh, on the grounds that it contains lots of ethnic Tibetans who are now "Chinese" (consider how it might view islands containing Taiwan-descended indigenes once Taiwanese aborigines become "Chinese"). It is using the same battery of techniques against Arunachal Pradesh that it has used against Taiwan, redefining visas and attempting to suppress international attention to the state -- it tried to kill an Asian Development Bank loan to the state, for example. Beijing has also ramped up its military presence in the Himal. Those of us who are wont to see Taiwan as an East Asian Czechoslovakia are one nation behind -- we are the East Asian version of Poland in that progression. There's not much more to say. Suffice to say that with The Blight now resident in Beijing, war looks to be inevitable. What pieces like Carpenter's really teach is that our choice is increasingly looking like not war or no war, but instead: what war shall we have? Hsichih trio found guilty again. As a friend pointed out, apparently these men will be on trial for the rest of their lives, since the system will not admit it made a mistake. Pics like this are why I love the Taiwan bird photos of John and Fish so much. The Kuokuang Petrochemical Plant -- stupid, expensive, unnecessary, unpopular -- but it ain't dead dead dead yet. Even though President Ma said it won't be built in Changhua, it could well be built somewhere else. What a patronage network plum that will be! And in an election year too! Driving at 60 kph into the hills beyond the Beitou rapid transit station, the minibus negotiates a couple of mountain curves, passing the Kuo-Hua Golf Course in the district of Siaopingding before coming to a halt at the ongoing construction site of Nan Kuo Village, a mountainside luxury housing development with expansive sea views. The luxury villas overlooking the mouth of the Danshui River and Taipei 101 are going for NT$800,000 per ping (about NT$242,400/sq. meter), and with the smallest units covering 256 pings (a ping equals 3.3 square meters), entry into this community will set you back several million bucks. A number of Chinese clients have already ponied up, looking to become the new neighbors in Greater Taipei. "Selling Taiwanese property to mainlanders is really just too easy," says one Chinese realtor. In Taiwan, you're not only buying a good living standard and good views, you're also buying rights to the land in perpetuity. 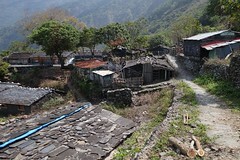 Relative to the residential property usage rights limits of 70 years in China and 99 years in Hong Kong, Taiwan's excellent system of individual property rights protections has become a major selling point since the opening of direct links and the subsequent signing of the Economic Cooperation Framework Agreement. And the newly wealthy Chinese merchant class does not shy away from high prices. To illustrate, initial sales of units in the Huang Hsiang F4 Building, a luxury residential complex along Songren Rd. in Taipei's Xinyi District that may fetch as much as NT$2.5 million per ping (about NT$758,000 per sq. meter), have been set aside for Chinese businesspeople. They have penetrated the computer and electronics, optoelectronics, banking and property markets, adding a new variable to Taiwan's competitive environment and quietly entering the lives of Taiwan's people. The online games children play, the houses and hotels we live in, our neighbors, the media we are exposed to and even our jobs – could all be under the shadow of Chinese ownership. Since Chinese investment in Taiwan was liberalized in July 2009, the Ministry of Economic Affairs' Investment Commission has approved 120 Chinese investment projects with pledged investment of US$140 million as of the end of February. The US$12.2 billion invested by Taiwanese businesses in China last year was nearly 100 times that amount (and cumulative Taiwanese investment there is nearly 1,000 times the amount). The numbers appear lopsided, but China's investment in Taiwan is actually far greater than the nominal figures would suggest. Through their use of a global network of subsidiaries and affiliates, Chinese enterprises have grabbed stakes in Taiwan in many different sectors, including those that have yet to be legally opened to Chinese investment. A number of big Chinese corporate names have entered Taiwan through affiliates in third countries (taking stakes of less than 30 percent). Many made plays of this nature even before investment permit regulations for Chinese investors were issued in 2009. Lenovo invested through the PC department of IBM Netherlands. Alibaba established a presence through its Singapore subsidiary, and telecom services provider Huawei Technologies Co. set up a Taiwanese branch office through its Hong Kong subsidiary. The effects on Taiwanese firms have yet to be felt. There has also been Chinese money quietly flowing into the property development now going on in Taichung, I have heard from two independent sources. Dunno if that is true. But it is clear that Taiwan's investment regulations and restrictions are easy to skirt and Chinese are pros at doing so. For years Chinese firms took money out China and funneled it through the Caribbean to return it to China as "foreign investment" and receive the tax breaks for being "foreign". ISS passes visible at night from Taichung for early May. Open letter signatories rip Ma Administration for response, bogus investigation of them. Statistical study suggests that during the Cold War the White House leaked info on secret coups to Wall Street so it could benefit by speculating on US firms. So much to catch up on. Apparently while I was off enjoying myself in the wilds of Pingtung political actors had the temerity to continue with politics. This must stop! Two other things a friend of mine noted in an email he passed around: Party identification for both Green and Blue camps is rising, with Blue in the lead. Additionally, income inequality continues to worsen. The rising tide is floating only the biggest boats; everyone else continues to slowly drown. The CIER rolled back their GDP growth forecast from 4.55% to 4.29% because of the bad news from Japan and other factors. Stagnant incomes could be a major weapon for the DPP to bash the KMT with in 2012. The big news today is that the Central Election Commission has approved holding the Presidential and Legislative Elections on the same day. There have been some complaints that this will disenfranchise thousands of younger voters since the Presidential election will be held earlier. It is hard to say how this will influence the election results, with reasonable arguments going in several different directions. Much of its effect will depend on the how the two Party machines handle mobilization issues. In recent days Shih Ming-te has lashed out at the DPP, saying it was worse than the CCP. This morning the pro-Green Liberty Times reported that he had said that the Chen Shui-bian government has less legitimacy than the Chiang Kai-Shek regime had. He is also involved in a spat with several of his former comrades over whether he had visited prostitutes, and has criticized Reverend Kao, who sheltered him during the days when he was on the run from the government after it smashed the 1979 Human Rights Day protest. The pro-Blue UDN reported today that the pro-Blue China Times had warned Shih that it would better if he kept his mouth shut. Nice thought, that. There's nothing unusual in this behavior. Tropical tests were first carried out near Kato Airfield, Formosa, in about 1930, and again in the summer of 1941. Included were tests on mustard shell, bombs, and spray, phosgene shell, tear gas spray, and self projecting toxic smoke candles. Colonel Saiki, of the Sixth Military Laboratory, described one unsuccessful mustard gas spray test (see ATIG 127), but no significant results were included. The ROC government has reaffirmed its sovereignty over four island groups in the South China Sea following recent international disputes in the region, according to the Ministry of Foreign Affairs. “The ROC has unquestionable sovereignty over the Dongsha, Nansha, Xisha and Zhongsha islands and their surrounding waters, from the perspectives of history, geography and international law,” MOFA said in an April 17 statement. The ROC cannot accept any counterclaim to sovereignty over, or occupation of, these areas, the ministry added. MOFA’s comments follow last month’s clash between a Philippine oil-exploration vessel and two mainland Chinese patrol boats in the South China Sea. Note that while analysts in the west often argue that Taiwan should be sold to China (and recall that many of these analysts have businesses in China), none to my knowledge has ever argued that the ROC government should drop its bizarre claims to the Senkakus and to the Spratlys and other islands in the increasingly touchy South China Sea. Wouldn't it be more logical to ask the government of Taiwan to drop these minor claims and see what effect that has before handing 23 million citizens of a democratic island over to a government that imprisons people for saying the milk is toxic? In addition to being potential flash points for conflicts, these claims to the Senkakus and the Spratlys also interfere in good relations with neighboring powers whose support Taiwan needs. Tito Bacchus' excellent article on casino gambling in Matsu. Having failed at promoting it for the Penghu, the government is now pushing it in Matsu. Taiwanese artists express support for Ai Wei-wei. Green in Taiwan needs more than lip service. The most effective way for Tsai to deal with the controversy should have been to give a swift and unmistakably clear denial of all the rumors. Tsai's angry refusal to respond for whatever reasons as well as widespread questioning of Shih's motive will only lead to more damaging speculations about her. Fang's commentary is rather weird in its tone and wording, as if Fang is trying to be ironic and failing miserably, but it does point out that speculation about her sexuality may hurt her in Taiwan's political culture. Contrary to Fang, Tsai's response, taking the high road, I thought was the right one for both her and for the island's political culture. Had Tsai utterly denied the rumors, it would confirmed that this kind of attack on someone's sexuality is both effective and legit. Instead, her response delegitimized this type of attack itself, pointing towards the day when it will be unacceptable to publicly hack on the sexuality of prominent individals in Taiwan. This attack on Tsai was universally condemned in the Blue and Green press in Taiwan. Focus Taiwan has a sample. Lots of people are peeved at this attack on Tsai, but remember this crap? Chuang also branded KMT presidential hopeful Ma Ying-jeou (馬英九) a "sissy," saying he was befuddled by Ma's popularity among female voters. Earlier this week, Chuang accused Taipei City Mayor Hau Lung-bin (郝龍斌) of imposing "blue terror" when the city tried to stop the construction work from proceeding. When asked if the ministry approved of Chuang's conduct over the last few days, Tu said Chuang is "a model public servant worthy of emulation by all government workers." Remember the rumors constantly swirling that President Ma is gay (Johnny Neihu had a field day with them)? Chuang was making a coded attack on Ma's sexuality. Same crap Shih Ming-teh pulled this week. Hopefully when this current flap over Tsai's sexuality fades, then people will remember how utterly childish and medieval this kind of attack is and it will stop, and they will finally realize what a pathetic, cringing Wormtongue Shih Ming-teh has become in what should have been the golden years of a long and honored career of service to the people of Taiwan. Working in the onion fields outside Hengchun. The other day the Central News Agency (CNA) reported that Chen Shui-bian gave $400,000 in subsidies to the Chinese dissident Wang Dan. Wang Dan has denied this today (see Taipei Times report). The story that reached my ears (which I can't verify) was that the CNA story was based on a "leak" from a single source (to multiple press organs which then give the appearance of independent corroboration) about what Wang Dan testified to in court (meaning the leaker breached Court confidentiality). Note that Wang Dan denied getting money from the Chen Administration in print and on his Facebook page, meaning that either the CNA report is wrong or Wang perjured himself in court. You can make the call yourself, but it seems to me that Wang is telling the truth. Push away the smoke and take down the mirrors, and what we really have is an investigation-within-an-investigation -- it appears that Chen Shui-bian is being prosecuted because he beat the KMT twice in free elections. But beyond that it appears that at least one purpose of the investigation is to uncover the money flows and links between dissidents in China and the pro-democracy side in Taiwan. A side benefit is the bonus of discrediting Wang Dan for being a DPP tool. Smells like a KMT trick? The Open Letter to President Ma is being attacked using the same tactic. An editorial in the China Post claims the Open Letter is a ploy of Su Tseng-chang's. The editorial contains a hilarious misreading of the grammar of the letter, but beyond that, note the chosen tactic: it's all a DPP ploy. The writers were working with a Chinese language original, the editorial implies. Even funnier is the letter's choosing of Nat Bellocchi as the sinister head of this DPP plot: the China Post editorial (and KMTers commenting on the letter) appeared to have chosen Bellocchi because his name is first. And his name is first because....drumroll....the list of names is in alphabetical order. Other fun stuff? Yes, then there is the "DPP" "candidate" Hsu Hsin-liang. A former Chairman of the DPP, Hsu jumped ship in the late 1990s, and formed the Mountain Alliance with other DPP renegades Sisy Chen and Shih Ming-te. The Mountain Alliance follows the KMT line and ran against the DPP in elections. Hsu's position in the election primary is exactly the same as the KMT's. No doubt he'll run as an independent in the election, just to make trouble. Sowing confusion and doubt in the DPP primary. Smells like a KMT trick? Then there is Shih Ming-te, also a former Chairman of the DPP, who also switched sides in 1999 or 2000 and later acted as head of the pan-Blue-run faux Red Ant protests during the Chen Administration. After vanishing into obscurity for a while (and being sued by his followers for allegedly misappropriating funds), Shih re-appeared to blast the DPP's Su and Tsai the other day, voice his support for -- drumroll -- Hsu Hsin-liang, and ask Tsai Ing-wen to "clarify" her sexuality, essentially accusing her of being a closeted lesbian. Lessee -- DPP turncoat Shih supports DPP Hsu turncoat advocating KMT positions in the DPP primary. No doubt it is all in good friendship. Yes, that passionate intensity of the KMT. It's really been on display this week. ADDED: Klaus with a long and hugely informative post on Hsu Hsin-liang. And ROFL at Nick on the China Post's discovery of a new tense in English, the singular tense. Tsai Ing-wen. And that's Dave Reid's camera there in the foreground. Topic: Her Vision of Taiwan for the Future and How that Differs from the KMT. Dr. Tsai wishes to speak to people concerned about Taiwan and its future; many of you have been here for some time and care about Taiwan. Her English is excellent. Questions: We will try to have as many questions as possible. We ask that they be brief and focused; focus on question, not personal observations etc. one per person, no second questions until everyone else has had a chance for his/her question. When asking a question, identify yourself and then ask. Attendance: For planning purposes, we need to know how many exactly are coming; many of you have already let me know, the rest please email me by Thursday. Directions: Bus: The cafe is not far from the corner of Nanking East Rd. Sec. 2 and Sungjiang (Songjiang) Rd. Many buses go down Nanking and Sungjiang. If taking a bus up or down Sungjiang, you are closer if you get off at Chang An Rd. Lane 69 is on the East side of Sungjiang, one block north of Chang An, about 3 blocks south of Nanking. MRT If taking the Red Line, transfer at Minquan W. Rd. to the Luzhou Line and take it to the Sungjiang (Songjiang) Nanking Station, use Exit 4 and walk south on Sungjiang. If taking the Blue Line, transfer at Zhongxiao Xinsheng and go north on the Luzhou Line to Sungjiang Nanking Station and use Exit 4. Lane 69 is easily identified because there is an Ikari Coffee Shop at its corner. Walk east on Lane 69 to #8 and use the stairs down to the basement--a special outside entrance. Since this is a new location for us, it would be best to plan a little extra time in finding it. Those that want a breakfast could come early and have it at Ikari Coffee Shop or other places in the area. I think this is a rare opportunity for all our members to meet and interact with a person who has a good shot at being the next president of Taiwan, as well as the usual benefit of networking with and sharing each others company. Afterwards, people can either go for lunch upstairs, or at Ikari or at many other cafes in the area. We look forward for all of us having an enriching experience. Following the letter’s publication, some Chinese Nationalist Party (KMT) lawmakers, including Chiu Yi (邱毅), appeared on TV talk shows on Monday night and questioned whether the signatories were fully aware of the content of the letter. Bruce Linghu (令狐榮達), head of the ministry’s Department of North American Affairs, said yesterday the ministry would contact each of the signatories to check if they initiated the petition themselves or just added their names to it, what their concerns were and what exactly they knew about the matter. “We heard that Bellocchi seldom goes out nowadays and it is not so often that people have a chance to talk to him. It seems he has not been well recently. We are checking this out,” Linghu said. Linghu said the ministry would make it clear to the signatories that the government’s decision to turn over the missing documents’ case to the Control Yuan for investigation was made based on the law and would ask them to respect Taiwan’s legal system. KMT Legislator John Chiang (蔣孝嚴) yesterday asked Hou to give him a copy of the original letter along with other open letters addressed to Ma by Bellocchi and others in recent years. Chiang said he doubted the original letter was written in English, as the ministry has said. “It’s a reasonable assumption that the letter was originally written in Chinese. [Bellocchi] had a written Chinese version in place and had others put their names on it. Their position has been clear, which is to attack the Ma Ying-jeou administration, accusing it of taking democracy a step backward, abusing political power and harboring political motives,” Chiang said. The KMT plan is make it appear as though the letter is a nefarious plot of the DPP. But I am familiar with its history and can assure readers it was written in English and sent around to each of the signatories in that language. Not that you guys believe John Chiang anyway. The instant reach for DPP-led conspiracy sheds light on the KMT reaction to the assassination attempt on Chen Shui-bian by a disgruntled Blue supporter. It seems a handy response to anything that places the KMT in a bad light. Feelin' that chill? Yes, it's the apparent use of government organs to chill free speech in Taiwan by "investigating" people who speak in a way the government doesn't like. Scary. Hope the public is paying attention. Brookings essay on Protecting Women and Children on Taiwan: laws need revision. Bellocchi nails it once again: "Arms sales to Taiwan are not the real irritant to the Chinese. Taiwan’s existence as a free and democratic nation is what really bothers the authoritarian rulers in Beijing." Obama's top Asia man, Jeff Bader, leaving his post. Global warming is making Taiwan's climate bipolar. Way cool: using seawater to cool Honolulu while cutting carbon emissions. Another week, another four days in Pingtung County at the invitation of the County government. Yay! They wanted me to spend eight days in Kenting. What am I to do with eight days in Kenting? The answer is: everything! My first night was spent here in Sichongxi, the spa town just a few kms east of Checheng, on Rte 199. Clean rooms, plenty of hot water, friendly service. The chatty locals notwithstanding, the weather looked like it would interfere with my plans to do the loop through northeastern Kenting, 199 to 200. Sure enough, once I had climbed above Shihmen town into the hills, it started to rain. Here the Stone Gates, the site of the battle between local aborigines and the Japanese in 1874, bracket a gray sky. Taking a break in front of the dam in Mudan township. Looking over Shihmen town in Mudan township, I spotted good weather to west. I changed my plans, and headed to the west, taking 151 over to 26. Onions were being harvested everywhere in Kenting. No one sings about fields of onions, but they make big bucks. Onions waiting to be weighed and bagged. I stopped by the east gate of Hengchun, the only city in Taiwan with extensive sections of its wall preserved. The government has restored this part, making for great atmosphere. Hengchun city maps are visually impressive. I went over to Manjhou township to leave my stuff at Kentingdon, a resort village outside of Manjhou town. Highly recommended if you have the cash to burn. 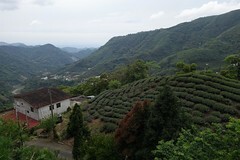 The service is friendly, the resort has all sorts of amusements, and the area around Manjhou is one of the loveliest agricultural landscapes in Taiwan. The deer paddock at Kentingdon Resort. Then it was out to Jialeshui, the surfing mecca, for lunch. This is Rte 200 going into Manjhou town. Lunch in Jialeshui at Jessie Hong's place. Great food, great owner. Manjhou town and the hills around it. I spent the afternoon riding the small roads around Manjhou town. Really a rewarding experience. The coast road from Jialeshui around Euluanbi to the lighthouse is stunning. On weekends it is filled with cyclists. Plenty of places to stop and take in the scenery. Motorcyclists take in the view. Taking a break to take in the scenery. This is one of my favorite spots on the whole island of Taiwan. Then it was into Kenting to Starbucks for coffee and second breakfast. Because scenery viewing is hard work. There are some excellent scooter lanes going into Hengchun town. The Folk Music center in Hengchun. The town apparently has its own distinctive music style. 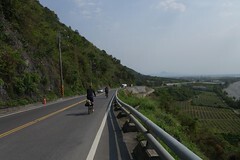 On Rte 200 between Hengchun and Manjhou is the Chuhuo National Scenic Area. Natural gas leaks from vents in the earth, where from time to time it is ignited by lightning strikes, teenagers with lighters, and other natural causes, resulting in fires. The area has some good walking paths and once you work your way up the slopes the views are nice. The beach at Jialeshui. A popular surfing site, surfing lessons, boards and rooms can be rented in the little community just above the beach. Once again, lunch at Jessie's in Jialeshui. The wooden tables are hers. She was kind enough to pose for this culturally significant shot of bathing apparatus and surfing apparel technologies. After lunch I continued up the road from Jialeshui to the Jialeshui Scenic Area, a stretch of wild rocks that equals anything in northeastern Taiwan. With the purchase of the 80 NT ticket, you can get a ride on one of these tour vehicles, that take you down the 2 kms or so of concrete path while explaining how things work. Or you can just ride your bike. The wild rocks of the Jialeshui Scenic Area. Beyond this point there are no roads for several kilometers; friends of mine who've hiked that stretch say it is wonderful. Hopefully I can get to it next week. Once more into the bucolic loveliness of Manjhou to get my car and head over to Hengchun. In Hengchun I stayed at the Kenting Resort Training Hostel, which is on the grounds of a high school whose vo-tech program it serves. Clean and well stocked, but you're better off buying your own breakfast. Since there was still time to explore, I visited the Hengchun Old Street, passing the South Gate along the way. At Shipai Park the goverment has mounted some old stone tablets. The gate in Hengchun seen in the movie Cape No. 7. Cyclists: there's a Giant shop nearby. Monday morning dawned bright, so I rode down to Kenting Street for breakfast. My first goal was Sheding Nature Park and the Kenting Forest Park, both popular hiking spots. Cycling up the climb up to the entrance makes a nifty warm-up activity on a warm Kenting morning. Sheding is about 700 meters from the Kenting Forest Park. The parks path are cut through coral rock and offer unique organisms and topography. Not to mention an enjoyable hour or so of hiking. Lots of locals out enjoying the paths. The park also offers excellent views over Kenting to the ocean. The paths are clearly marked. The park is full of wildlife, and if you are really lucky, unlike me, you might be able to get a good shot of a butterfly. I also shot the alert lizard at the top of the post in Sheding. After hiking in Sheding, I stopped by the visitors center to apply to enter Nanren Lake next week. I then rode over to the Longluan Lake Nature Center, a popular birding spot. I know you've always been curious about the Sisal Industry Historical Monument in Kenting, and since it was along the way to Longluan, I decided to check it out so you wouldn't have to. The monument, located on an old sisal plantation, is apparently still under development. There are just a few displays. Longluan Lake Nature Center is at the end of a lovely little path, along which are signs identifying organisms and their environments. Really a pleasant experience. The center is specifically aimed at birding, and the government has constructed an artificial island nearby to attract birds. Unfortunately it wasn't the right season, and the only bird visible was this hunting bird who was having no more success than I was at finding birds. The view northeast over the lake towards Hengchun is splendid. From Longluan I took a spin across the tiny peninsula on the west side of Kenting to the fishing port of Shanhai, where I always stop for lunch. Way too much food for one person, but I made a valiant effort. From there it was around Maubitou and Houbihu, stopping here at Baishawan Beach. On Monday Kenting roads are empty, but full of promise. Tune in next week for the final installment, including a visit to Nanren Lake, a restricted nature reserve. 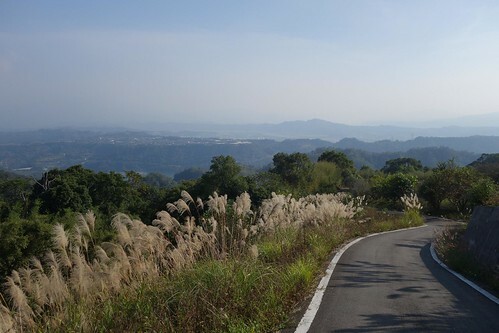 Hope to see you on a Pingtung Road soon!